The first Mini Cooper car rolled off the production line on 26th August 1959. This small, two-door car was designed for the British Motor Corporation by Sir Alec Issingonis and cost about £496 to buy - about the amount of money someone earned in a whole year. The first section of motorway in Great Britain, the M6 Preston Bypass, was opened on 5th December 1958 by the Prime Minister Harold Macmillan. The first section of the M1 motorway then opened on 2nd November 1959 and contained the first service station for drivers to take a rest stop at, Watford Gap Services. Motorways were built for high-speed traffic and as there was no speed limit on them at first, the cars could travel very fast indeed. The world's first jet aeroplane to carry passengers, designed and built in Britain, was called the Comet and it began a regular passenger service on 2nd May 1952. With a top speed of 503mph, it allowed people to easily take holidays abroad. 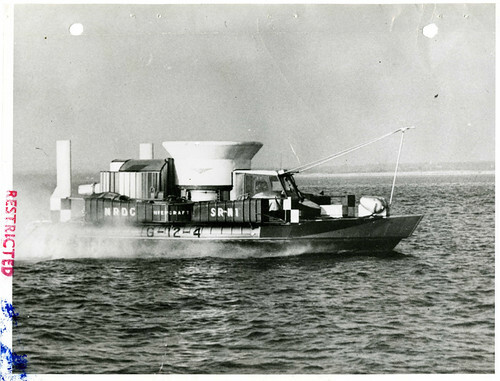 The SR.N1 hovercraft successfully crossed the English Channel on 25th July 1959 in just two hours, three minutes. Designed by Sir Christopher Cocerell, the hovercraft was a vehicle designed to hover just above the water on a cushion of air.